Carson and Trump were once rivals competing for the GOP presidential nomination. “I am thrilled to nominate Dr. Ben Carson as our next Secretary of the US Department of Housing and Urban Development,” Trump said in a statement. “Ben Carson has a brilliant mind and is passionate about strengthening communities and families within those communities. HUD “oversees homeownership, low-income housing assistance, fair housing laws, homelessness, aid for distressed neighborhoods, and housing development,” according to its website. The news comes after Trump tweeted about his interest in Carson about two weeks ago. Moreover, on Monday, Nov. 28, sources “close to the appointment” confirmed to HousingWire that Ben Carson would officially accept the role. A Facebook post from Carson on Nov. 23 also indicated that Trump would likely tap him for the job. Previously, Carson suggested he wasn’t interested in a government position after being offered the job as head of the Department of Health and Human Services a few weeks ago. If confirmed, Carson will be the first African American appointed to a senior position in Trump’s cabinet. He would replace Julián Castro, the former mayor of San Antonio, and President Obama’s appointee since 2014. Prior to Castro, New York City’s housing commissioner Shaun Donovan filled the role. Given Carson’s health care background (he was the director of pediatric neurosurgery at Johns Hopkins until his 2013 retirement), Trump’s decision breaks the tradition of appointing HUD secretaries with local government or housing and real estate experience. “Realtors know that the incoming Secretary of Housing and Urban Development has a big job ahead,” said National Association of Realtors president William E. Brown in a statement. “Potential homebuyers face a range of hurdles, from rising prices to mortgage credit that’s burdened by fees and extra costs. 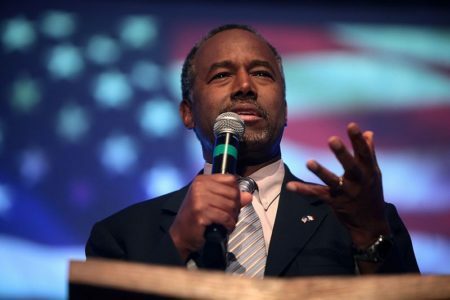 “The choice of Ben Carson is about more than FHA premiums and rules, but it will play a role,” said Ken Trepeta, executive director at RESPRO (Real Estate Services Providers Council), in a statement. “With so many qualified candidates to choose from with deep knowledge of, and commitment to affordable housing solutions for the poorest families, and with the housing crisis reaching new heights across the country, Dr. Ben Carson’s nomination to serve as HUD secretary is surprising and concerning, given his lack of experience with or knowledge of the programs he would oversee,” Yentel said. Editor’s note: This story has been updated with comments from NAR, RESPRO and the National Low Income Housing Coalition. Who's in the running to be Trump's new HUD secretary?